The 1964 science fiction classic, "Robinson Crusoe on Mars," paraphrased an old adage, "Water is where you find it." NASA's exploration of the real Mars has paraphrased further, "On Mars, water seems to be where you look for it!" Intensive exploration of Mars by NASA spacecraft continues to pay tantalizing dividends in our quest for signs of liquid water, and the potentially life-friendly environments it could offer. Here are a few recent finds by the Curiosity rover, and other spacecraft. 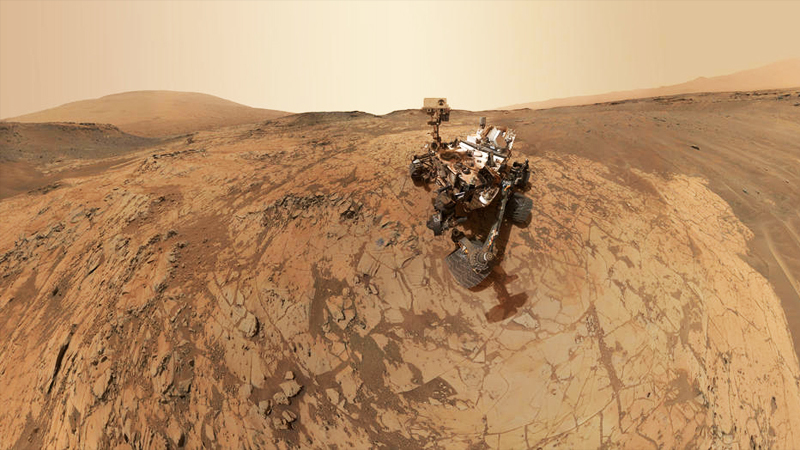 Recently, NASA's Curiosity rover discovered a mineral formation that drew the eye of mission water-seekers. Criss-crossing the bedrock of a site named Garden City are raised veins of whitish material, marbled through the rock in a very particular pattern. On Earth, similar formations of mineral veins lacing through rock are created when water, flowing through cracks, deposits minerals. 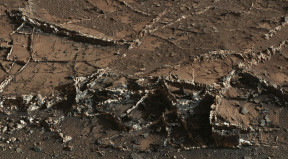 In Garden City on Mars, erosion of the surrounding rock has exposed the veins, forming small ridges as high as 2.5 inches and an inch or so wide. Upon closer examination, the veins were found to be two-shaded, with darker material at the edges sandwiching a lighter layer between. This indicates a process that involved different liquid water solutions depositing different minerals at different times. Curiosity, as well as the veteran rover Opportunity, had found outcroppings of likely water-formed calcium sulfate in other locations, but the two-tone veins at Garden City offer a more detailed glimpse into the story of how the environment, at least locally, may have changed long ago. As Curiosity continues its climb up the slopes of Mount Sharp, exploring ever-younger layers of sediment, a more complete picture of how the apparently watery Mars of long ago became the dry desert world we know today will develop. While most of Curiosity's instrumentation is geared to study the chemistry and morphology of the Martian soil and rock, atmospheric data collected by its Rover Environmental Monitoring Station (REMS) has produced a fascinating watery possibility as well. For more than a year, REMS has measured atmospheric temperature and relative humidity in the lower region of Gale Crater where Curiosity is exploring. From these measurements, along with the previous detection of perchlorate salts in more than one location on Mars, a theory has developed suggesting that liquid water on Mars' surface isn't necessarily a thing of the distant past. As the theory goes, under the right conditions of temperature and relative humidity, salty minerals like perchlorate, which draw in surrounding water vapor from the air, can form a liquid brine in the soil—most likely at night when temperatures drop. Overnight brine moisture would evaporate under the sun's rays after dawn, but for a time the mixture would form a substance that might be characterized as "Martian mud…." Under typical Martian surface conditions today, liquid water cannot persist due to the low atmospheric pressure and temperature, which tend to drive it into gaseous (water vapor) or solid (ice) states. But with perchlorate in the mix, water's freezing point can be lowered--not unlike how we lower the freezing point in an ice cream maker by adding salt! Though Gale Crater, located near the planet's equator, is one of Mars' least likely climates for brine-forming conditions, Curiosity's observations suggest that small amounts could form for short periods. In Mars' higher latitudes, where atmospheric relative humidity is greater and sunlight less intense, the conditions are more favorable. In fact, overnight brine accumulation is a leading contender to explain downhill flows of material observed by the Mars Reconnaissance Orbiter spacecraft on high-latitude steep slopes. Another recent detection made by Curiosity is that of "ready to eat" nitrogen—so to speak. Though this detection does not pertain to water, it is of possible relevance to the same ultimate goal of Mars exploration: detection of life-friendly environments on Mars. This time it was SAM's time to tell the story—SAM, the Sample Analysis at Mars instrument. SAM detected nitric oxide (a molecule of one nitrogen and one oxygen atom) in a collected soil sample. The nitric oxide is thought to have been released when nitrates in the sample broke down as it was heated—and in any case, this marks the first discovery of "biologically useful" forms of nitrogen on Mars. Nitrates in general are nitrogen-bearing molecules of a form that living organisms can make use of in the life process. In Earth life, obtaining nitrogen from the environment is crucial, since it is an essential element of such important molecules as DNA and RNA, among other things. Though nitrogen is abundant in Earth's atmosphere, making up 79% of it, most of it is in the form of nitrogen gas, a molecule of two very tightly bound nitrogen atoms. Most life forms on Earth cannot make use of nitrogen in this form, though certain organisms can break it apart and convert it to usable forms, and in doing so introduce nitrates into the food chain. Scientists don't believe that the nitrates found in Mars' soil were produced by biological activity, but rather by non-biological processes, probably long ago in Mars' past. Energetic events like meteorite impacts and lighting strikes are two possible nitrate-forming agents. Whatever the source, the fact that nitrogen in a form that Earth-organisms would "eat up" is present adds to the preponderance of evidence that Mars once had a habitable environment. Whether anything actually inhabited Mars is still an open question, but one actively being pursued by missions like Curiosity.